Planning a wedding is hard — really hard. But it doesn't have to be! Spooky Nook is the perfect location for all your wedding needs. We can accommodate weddings of all sizes, house your out-of-town guests at the Warehouse Hotel and host your rehearsal dinner at Forklift & Palate restaurant. Even if your wedding ceremony and reception are at another location, the restaurant is located conveniently near Manheim, Lebanon and Lancaster. Private party rentals at Forklift & Palate will take away some of your wedding-related stress. We can accommodate large parties. Do you have a lengthy guest list for your rehearsal dinner? Are you having trouble finding a restaurant that has space big enough for everyone? Don't worry, you don't have to trim down your guest list. Forklift & Palate has spaces for any size party. Were you hoping to have drinks at the rehearsal, but were unsure of what to buy? We offer a full-service bar in several of our spaces. Let your families mingle with a great brew or cocktail. Hold the toasts with bubbly champagne or sparkling wine. Our diverse menu lets you pick the perfect food for your rehearsal dinner. Whether you're holding a traditional, more formal sit-down meal or a casual gathering with h'ordeuvres, we can help you pick out the perfect menu. Forklift & Palate will set up and clean up. You can still arrive early to decorate and make any adjustments to the space. At the end of the night, you can say goodbye to your guests — until the next day, at least! — and then head home. There's no messy cleanup to worry about. Once we've worked out the details of your rehearsal dinner, let Forklift & Palate take care of everything. After you've finished rehearsing the ceremony, you should relax and have a great night before your big day. Send out invitations far enough in advance so you can get an accurate headcount. You can still use an estimate of your number of guests when choosing a rental space at Forklift & Palate. 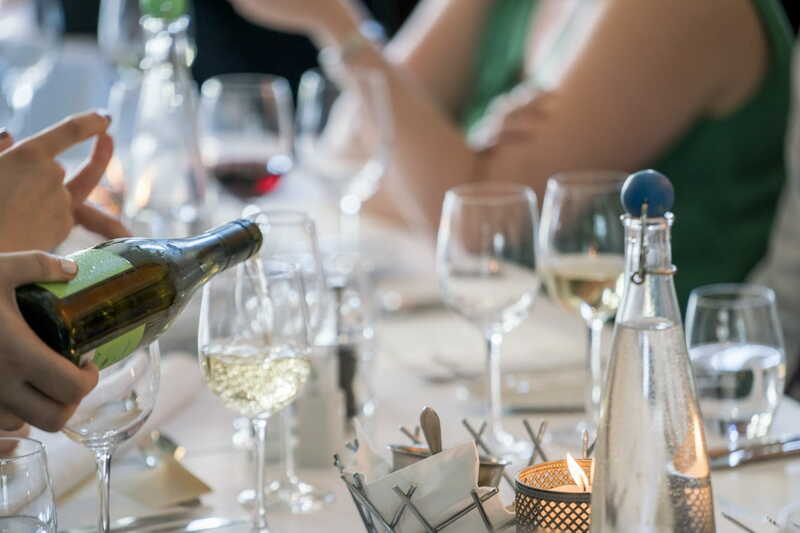 Don't invite your entire guest list — usually, guests to a rehearsal dinner include the wedding party, the immediate family of the couple and any plus-ones. Let your guests know how formal the dinner will be so they can dress appropriately. Make sure you get home at a reasonable time so you can get enough sleep for the big day — the rehearsal dinner shouldn't go too late! Forklift & Palate is the ideal setting for making the perfect rehearsal dinner a reality. The night should be all about you — let us take care of everything. Contact us for reservations today!